The structure and physiology of skeletal muscle determines many of the reactions to damage. 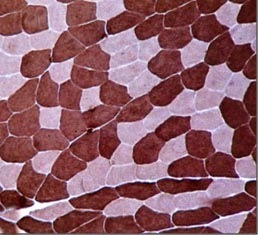 Striated skeletal muscle tissue consists of large, cylindrical multi-nucleate muscle fibres. 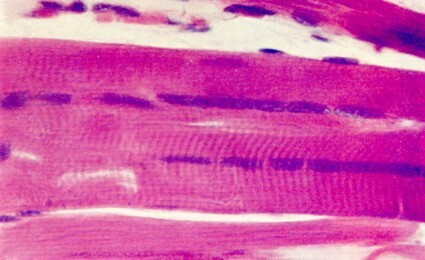 Muscles are wrapped in a dense connective tissue sheath called epimysium which is continuous with the tendon. The perimysium originates from this, and is made up of connective layers which go down into the body of the muscle and envelop the single muscle. The perimysium gives rise to the endomysium which is made up of thin connective layers surrounding each individual fibre. The vessels and nerves branch out around the body following the connective lamina. The vessels give rise to a rich capillary network which surrounds each fibre. Within each fibre we can see, even with an optic microscope, the striated effect which results from the thin fibrils arranged in parallel fashion along the longitudinal axis of the fibre. These elements are called myofibrils. Each muscle fibre is wrapped in a plasma membrane covered by a basal membrane. These two membranes together are known as the sarcolemma. 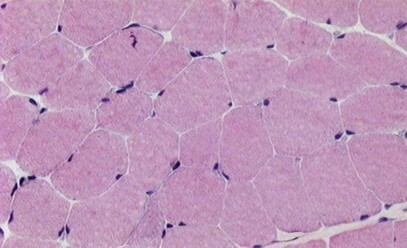 The cytoplasm of a muscle fibre is called the sarcoplasm. There are many different kinds of organelles in the sarcoplasm: Golgi apparatus, lipid globules, glycogen granules, abundant mitochondria and a very important structure, the sarcoplasmic reticulum. 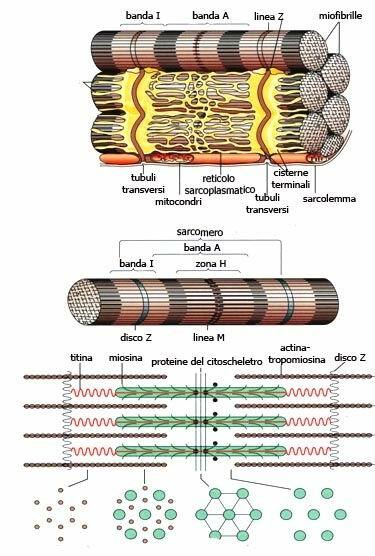 Diagram showing the myofibrils inside the muscle fibre. 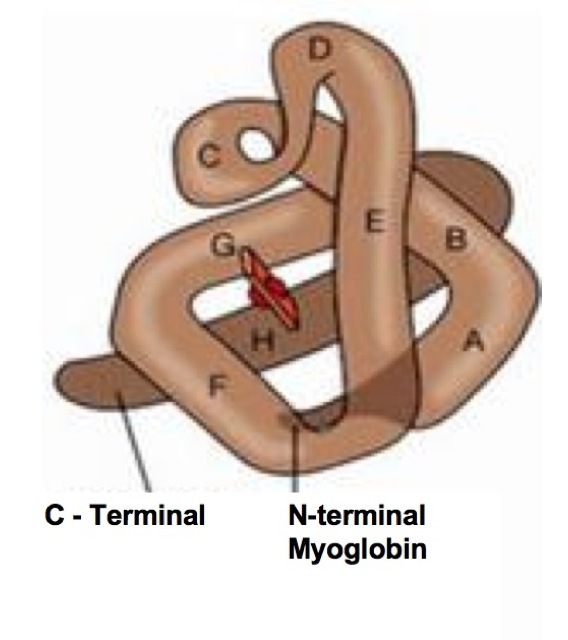 Myoglobin is also present in the sarcoplasm. 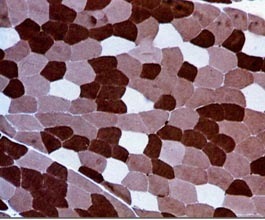 This is a protein which is linked to the iron which is partly responsible for giving muscle its red colour. This molecule stores oxygen, which is released during muscle contraction. 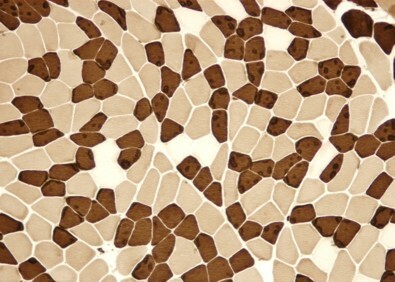 Biopsies and histochemical stains show that most muscle tissue in mammals is made up of a mosaic of different fibres, each with its own functional and metabolic properties. Metabolic properties can be analysed by determining the oxidative and glycolytic capacity of the myofibrils, the contractile properties through the myosin ATPase activity. The most commonly-used parameter today for differentiating between different types of fibre is myosin ATPase activity. 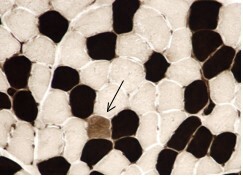 Since the contractile property of a muscle is closely linked to its myosin ATPase content, a histochemical test has been worked out whereby this specific enzyme is stained, thus allowing for identification of the fibre type. Muscle fibres are classified as Type I, Type IIA, Type IIB and Type IIC. Type I fibres are red (containing large amounts of myoglobin), contract slowly, have a reduced capacity for storing glycogen and poor glycolytic enzyme systems. They have high oxidative activities and low ATPase activity. The metabolism of these fibres is anaerobic allowing for low-level exercise over a long period of time. Type IIA fibres are white, fast-contracting, oxidative fibres with highly-developed glycolytic apparatus, but with a reduced number of mitochondria. Their level of myosin ATPase activity is high. Type IIB fibres are fast-contracting, non-oxidative fibres which are capable of storing large amounts of glycogen, have a highly-developed glycolytic apparatus and contain numerous mitochondria. These fibres have an anaerobic metabolism and are used for intense effort of short duration. In figure: ATPase pH 4.6 enables us to differentiate between the different type 2 fibres. The 2A fibres are white and the 2B grey. Type I fibres are dark. Fibres which have high levels of oxidative activity have more mitochondria in the subsarcolemma and inter-myofibrillar regions than those with lower levels of oxidative activity. 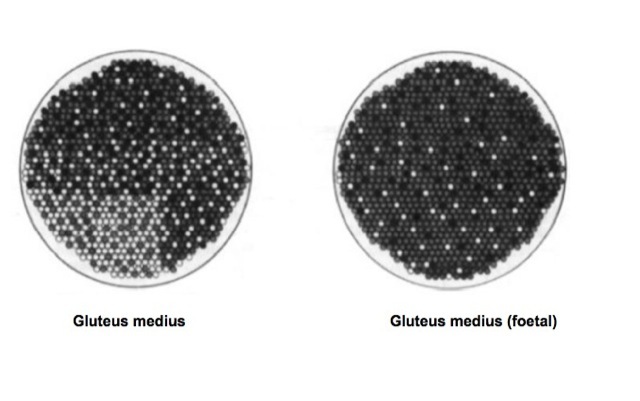 Slow-contracting muscle fibres have abundant deposits of lipid globules, whereas fast-contracting fibres with high oxidative activity have very few. In fast-contracting fibres but with low oxidative activity the lipid accumulation is negligible. Fast-contracting fibres need a faster turnover of Ca2+ and so have a better-developed sarcoplasmic reticulum. Type IIC fibres are probably a primitive type of fibre which can be divided into types I and II. They are transition fibres so young people have a high percentage of these whereas they are rare in adults. Percentages of the different fibres can be changed significantly by training, and type IIA and IIB fibres can be easily inter-converted. 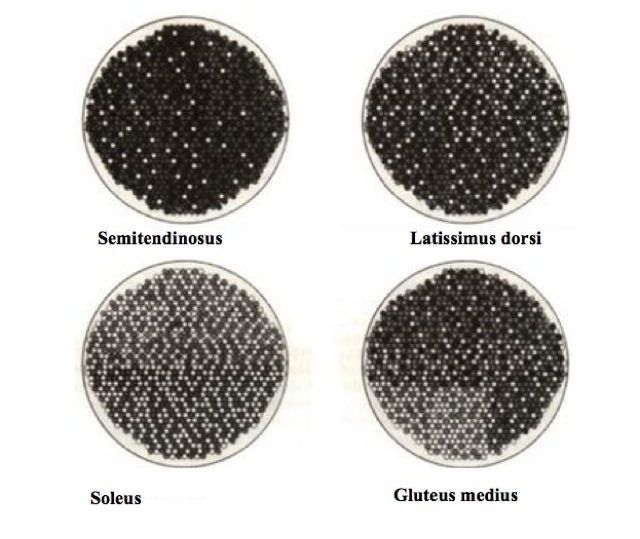 In thoroughbreds, the ratio of Type I to Type II fibres ranges from 0.15-0.23; in trotters it is between 0.25-0.38 and in heavier draft horses it is approximately 0.40. During low intensity work, Type I fibres are the first to be used. Their glycogen stores are the first to be depleted and they are recruited for long-distance work. When slow-contracting muscles have used up their glycogen stores Type IIA and IIB fibres are then used. This phenomenon can be observed during long-distance events too. Glycogen stores are replenished in the opposite order; Type II fibres are first, before Type I. Exercise, therefore, needs to be limited during the period after a competition to enable glycogen stores in the muscle to be replaced. Oxidative activity is taken as the principle metabolic marker for the classification of the main types of muscle fibre. 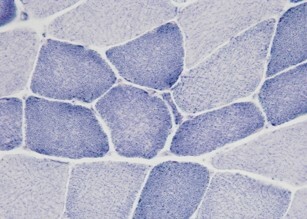 The oxidative capacity of muscle fibres is assessed through staining: succinate dehydrogenase- SDH nicotinamide adenine dinucleotide dehydrogenase reduced NADH. 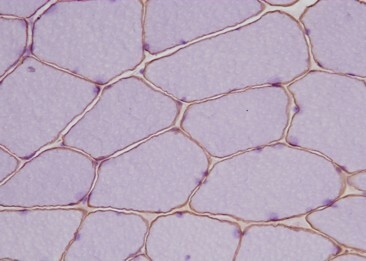 The glycogen content of muscles can be worked out using the PAS period acid – Schiff stain reaction. 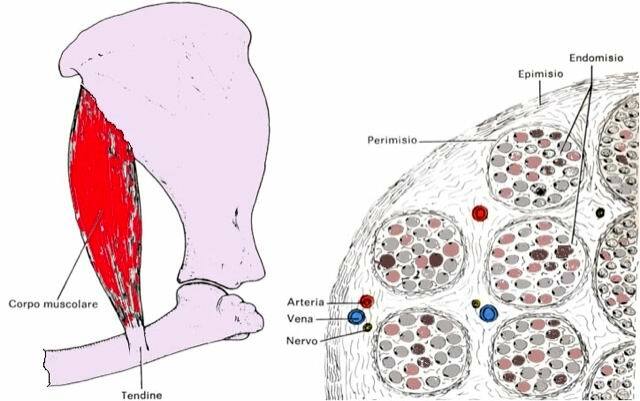 In terms of pathology, we can see processes whereby muscle fibres of the same type cluster together (type grouping) or damage which is limited to / and / or prevalent in only one type of myofibre. Type grouping: chronic denervation and reinnervation. Prevalence of type I fibres: Central core; RYR1 mutations; Congenital myopathy; Large fibre type grouping; Demyelinating neuropathies. Atrophy of type II fibres: in secondary myopathies like hypothyroidism or hyperadrenalcorticoidism, in disuse atrophy and ageing.